When you are getting your landscape designed and installed, the landscapers need to make sure the grading is right. If the lot has sloping land and you need certain outdoor features such as a driveway, walkways, patio, an outdoor kitchen or even a fire place or fire pit installed; a certain portion of the slope may have to be excavated (depending on where the slope is located). The spot will then be graded and made ready for the feature. However, the portion of the slope that has been exposed due to the excavation will need some support. Failing to provide the right support can result in soil erosion and mudslides, both of which can damage your outdoor features and the landscape. This is where retaining walls come into the picture. 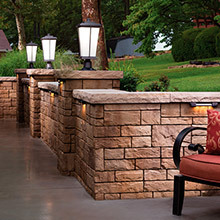 We at PHX Pavers and Landscaping are the retaining wall specialists and handle every aspect of it in the best possible way. 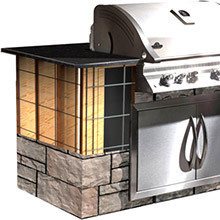 We cater to customers in and around Phoenix, Glendale, Paradise Valley, Tempe and Scottsdale. 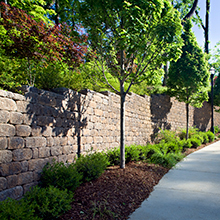 Our company has also built a very strong customer base across Peoria, Mesa, Sun City, Avondale, Goodyear and Chandler where we have handled a large number of retaining wall construction projects. 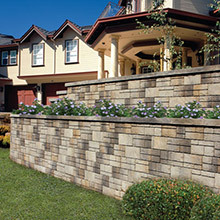 BelAir Wall Collection- This collection of retaining wall blocks has a hand-cut stone look. They are available in a range of widths and heights and are an excellent alternative to conventional retaining wall systems. 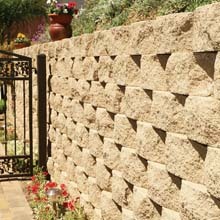 These stones can be used to build freestanding walls along the periphery of a courtyard or patio. If you want to add to the functionality of the wall, we can add in-built seating in the structure. 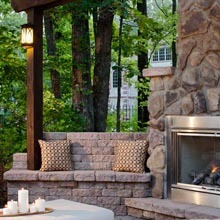 These types of walls become the best solution for fire place and fire pit areas in the landscape. Celtik Wall Collection- This collection has units with a time-honed appearance, with natural hues and textures. If you like a more well-worn and ancient styling in your landscape, these are the products to opt for. 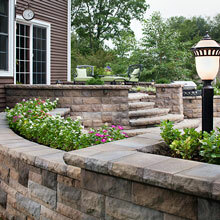 They complement the look of your garden borders, pavers and landscape contours to perfection. Aside from these collections you can also choose from the century wall system that is characterized by random patterns and a look of vintage natural stone. 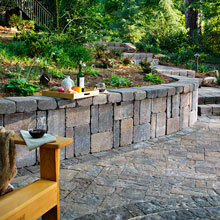 These concrete blocks are economical and emulate the look of expensive materials like natural stone. 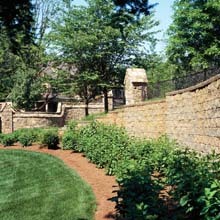 We can also build moderate-height retaining walls using the Country Manor Collection products. You can find a number of pictures of these different stones in a landscape setting, which will help you make a more well-informed decision. 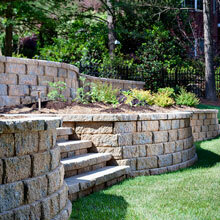 For all types of retaining walls installation, the only company you need to call is PHX Pavers and Landscaping. 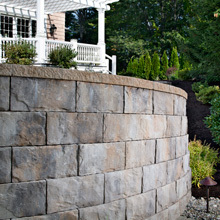 We can provide you customized services at a very reasonable retaining wall cost.